Mondaine Wall Clock model A990.CLOCK.16SBB. Quartz movement, matte aluminum case, white dial with black hands and indexes. , runs with battery or electricity, large 40cm(15 3/4") aluminum case, white dial with black hands and indexes. Mondaine Wall Clock model A990.CLOCK.11SBC. Quartz movement, red color aluminum case, white dial with black hands and indexes. Models designated on this page with status "in stock" from MONDAINE brand are available for your viewing pleasure on display at Denver Central store. 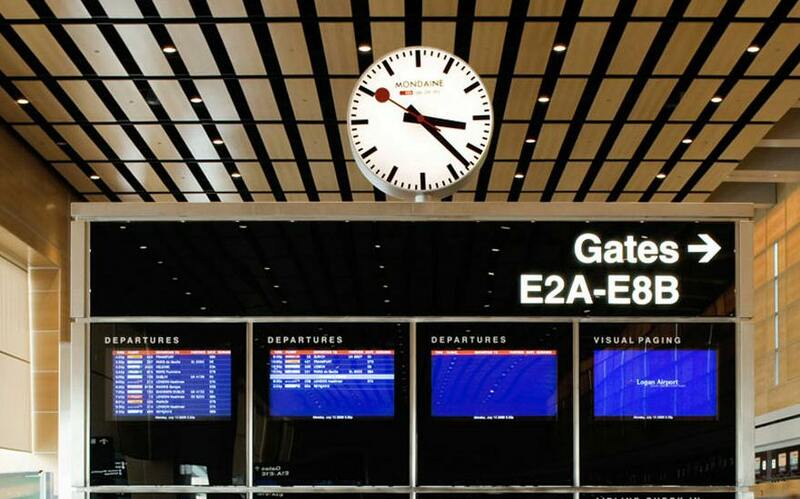 June 23rd 2009 marked celebration of the first Mondaine GPS clock arrival in USA inside the Boston Logan International Airport. A staple of Swiss travel, the Mondaine clocks can be found in train stations and airports throughout the Switzerland. The GPS-controlled Mondaine clock that has been permanently installed at the airport was part of the exhibition dedicated to the Science of Watchmaking and Time. It is placed in the international terminal above the Flight Information Display System. In Switzerland, 3,000 of these famous Swiss clocks have indicated the precise time at all Swiss train stations for more than 60 years. For more than 10 years, Right Time has supplied these superb Swiss clocks to many of the top US Hotel chains and business, so don`t be surprised to see Mondaine Swiss Railway clocks at the lobby or meeting room of the Westin hotels, Swiss bakery and etc. Call Rita at 888-846-TIME to arrange a purchase order for your hotel chain and proudly display examples of the Swiss finest. RIGHT TIME is the Official Factory Authorized MONDAINE Railway Clock Dealer.